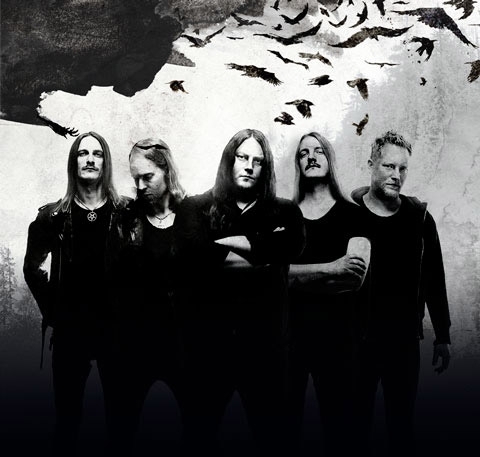 The release of Dead End Kings marked another impressive and distinctly melancholic episode in the twenty year career of depressive rock purveyors Katatonia. The Swedish band have been on the road in the States and Anders Nyström (guitar) took a little time to answer some questions we had for him on the record, touring, and what it all means. Scene Point Blank Night is the New Day was extremely well received; did you feel much (if any) pressure going into the writing of Dead End Kings? For the fans, expectation for this record was very high. How did you deal with such high hopes? Anders Nyström: You just try the best you can! And you do it with honesty, from the heart and that's it. That pressure itself is both good and bad. It's good if it comes from yourself because it will make you work harder and maybe go places you didn't expect or find aspirations that you didn't know you had within you, but if the pressure comes based on worrying about fulfilling other expectations and feeling pressured about not "delivering" it's not a good thing. 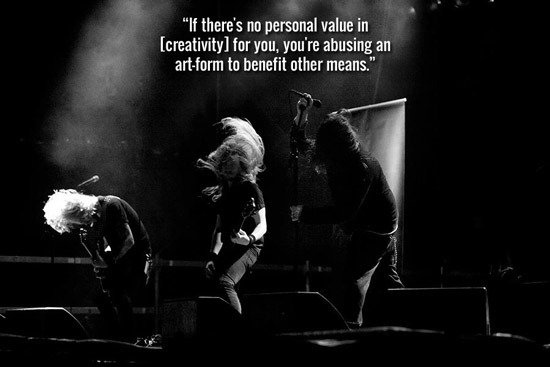 In our case, music is personal and shouldn't be tailored to anyone else’s demands. Ideally it should come from yourself and be done by yourself, without compromises, trying to nail your vision and make you feel proud and happy at the end of the day. If anyone else will enjoy what you created, well then you're blessed and lucky to get that as a win-win bonus, but if there's no personal value in there for you, you're abusing an art-form to benefit other means and I couldn't live with that. Scene Point Blank The title of the record is very evocative, is there meaning behind choosing this particular phrase and how does it link back to the songs on the album? Anders Nyström: The title is a reflection on how people measure Katatonia on a level of success. Having just celebrated our 20th year anniversary it seems like people take for granted we should be famous and rich and dwell in mansions, but we're not anywhere near any of that. We make our living on minimal salaries and have to work hard to pay our bills every month like most of the population out there. Explaining these facts to people always ends up with the same questions like, "Then why do you do it? Seems like you're just in a dead end..." and you try elaborate further that just having a band, the same band you formed 20 years ago, is a success in itself where we get to do what is the most meaningful in our lives: to write and perform our own music, without answering to anyone else. We're proud to be the “Dead End Kings!” Furthermore, we've been keeping this kind of tradition with our titles by making a paradox with a positive and a negative word in the same sentence, so here we go again. Scene Point Blank There's a number of tracks on the record that particularly stand out (for me at least). Could you possibly, if it isn't too personal, talk a little about them and how they came about? “The Parting,” “The Racing Heart,” “Ambitions,” and “Dead Letters” to name but a few. Anders Nyström: They were born and achieved no different to any of the other tracks, but I'm glad they stand out to you. So it's more interesting turning the question around, why do they stand out and what do they mean to you? What kind of vibes to these songs invoke? Scene Point Blank (Interviewers note) This interview was conducted via email. I really wish I had this conversation in real life. I can only imagine that what I would have said in such a situation. Scene Point Blank Death is a fairly big part of your work, both in truth and metaphor – is it something that you've always held a....fascination for, and does working through these thoughts through music help in any way? As a listener, Katatonia has always spoken to the darker side of the personality, and through your music I feel a lot of people have found that extra something missing from other forms of music. Anders Nyström: I think the saying "death is certain, life is not" pretty much summons up that fascination in the shortest yet most relevant way. It's an endless source of coincidence or destiny as it's unavoidable by nature’s own laws but, also, often comes unexpected and unfair. It's pretty bleak and morbid to emphasize so much on death as we do but, at the same time, we've been able to see some kind of morbid beauty in it, [we’ve] somehow integrated the subject to fit our music and vice versa. I don't know if it’s a human thing, but our lyrics and music are constantly fueled and fascinated by tragic events and it just keep getting our attention compared to other aspects on this planet. In a way it's just so natural to us that we don't even reflect on it generally but, when someone points out our themes are very depressive, I kind of realize it's a part of me and I haven't even chosen it to be that way. Scene Point Blank The cover art for the album is incredible. Who is behind it and how did you come to choose this particular artist? Anders Nyström: It's our good ol' friend and collaborator Travis Smith behind it. We've been working with him on a regular basis since 1999 and he's done pretty much anything we've put out since then. The reason for this long-lasting collaboration is because we have mutual respect for each other's work. We compliment each other’s way of thinking and bring the best out of any concept we’ve got going. I absolutely love brainstorming and designing stuff with Trav because what usually starts as one image usually folds into ten more as we go along. The essence of creativity! Scene Point Blank As a band that has been around for a little while, how do you go about keeping things interesting – both as a group and for your fans? What drives you and inspires you to continue making music? 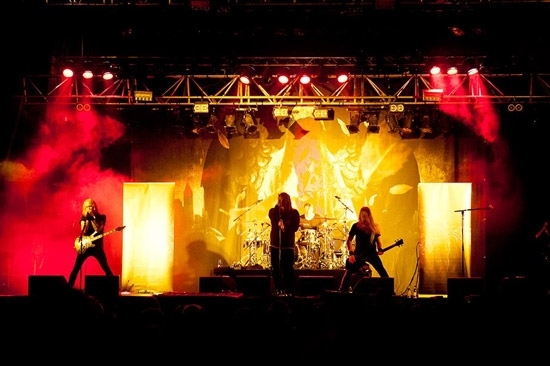 Anders Nyström: Well, it's taking longer and longer between albums these days. We cannot spit out albums every year anymore as we're constantly raising the bar with the promise that the next album has to top the last one but, to do this, there are several ways. You can look ahead and just keep going with what feels right, just put the next gear in motion and speed down the road. Then, sometimes, you need to completely go off route and head into the unknown, stumbling in the dark to balance it out, or you have to take a step back to see where you took a wrong turn. Or, like in the case with Dead End Kings, not take any step at all but just stay on the road and focus on your current position, maintain the sound and just try to write a new batch of songs that hopefully are even sharper than the last time around. Scene Point Blank How do you spend your days on the road on such long tours? Are there any particular bands you enjoy listening to/films you watch etc...? Anders Nyström: It's different considering if we're headlining or being support, but I'll get you a typical scenario as headliners on this current tour. You try to sleep for as long as you can, because you don't want to wake up while the bus is still in transit, so when you wake up you're usually parked outside the next venue and, if it's unfamiliar, you go in and check it out while the crew is setting up. Then the organised chaos starts! Trying to find something to eat, getting everyone online with their laptops to sort out the biz and get in touch with families, doing your soundcheck, doing a lot press and promo, maybe there's some "meet and greets" scheduled as well during the late afternoon. Then you try to find a decent place nearby to go grab some dinner before doors or while the support bands play. Then you head backstage and prepare yourself for the show. Maybe you watch some of the other bands from the side of the stage to get a vibe. 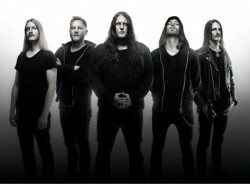 Scene Point Blank After the current touring cycle ends, what happens next for Katatonia? Do you immediately head back into "creation" mode or do you take time out to enjoy the break? Anders Nyström: It's pretty rare that we get to enjoy a real break/vacation unless it's the Christmas holidays, when everyone is off anyway. Since we do not write music while on the road, it's means that if we've been touring for 2-3 years, the first thing we need to do when we get back home is write and record a new album but, luckily, one thing rubs off on each other. If you've been touring for so long you're fueled to head back into the studio and vice versa. Scene Point Blank Fantastic, thank you so much for your time. Is there anything else you'd like to say? Anders Nyström: We're not here for a long time, but a good time! Cheers! Words by Cheryl on Oct. 21, 2012, 1:24 a.m.
Posted by Cheryl on Oct. 21, 2012, 1:24 a.m.
Posted Feb. 27, 2015, 11:05 a.m.
Posted Sept. 13, 2014, 9:06 a.m.
Posted Aug. 18, 2013, 11:09 a.m.